An adorable new picture has been uploaded by Beyonce of her super cute twins. The Crazy in Love singer has just completed the European leg of her, and her husband Jay-Z’s On the Run II, tour. She shared a lot of pictures of their vacation on her website. The pictures provide enough proof that the couple, whose marriage has survived a cheating scandal, is right back on track. The couple decided to bring their children with them for the tour, which kicked off on June 6 in Cardiff, U.K. Among the many snaps that she uploaded, one was of her twins sitting on her lap while she was holding them. It was a very sweet picture in which Rumi seems to be laughing cheerfully, while her brother, Sir, looks quite serious as he glances down in deep thought while sitting on his famous mother’s lap. The proud mother broke the internet with a debut picture of herself posing with the twins on Instagram to celebrate their one month anniversary last year. 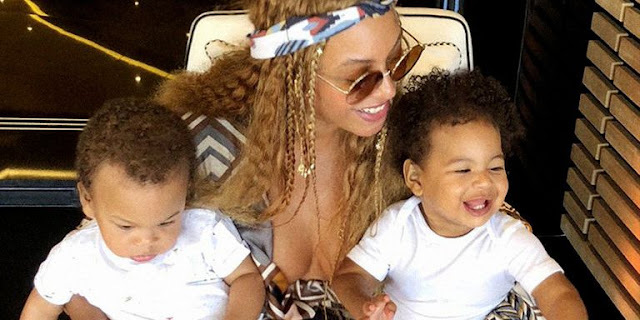 Now, this is the first real look of the twins after that picture which tells us that Beyonce has pulled back the curtain on her family life a bit more. Though recently, the twins were spotted briefly in a video of the couple’s vow ceremony which played last month on their debut On the Run show II in Cardiff. Among the other pictures the superstar posted is another one of Rumi in which she seems to be holding her rapper father's hand while they take in the view from the back of their luxury yacht. There is one of Blue, their six-year-old daughter, who’s sitting in the lotus position on a swing chair and another one of the mother and daughter posing while wearing similar and cute pink dresses.